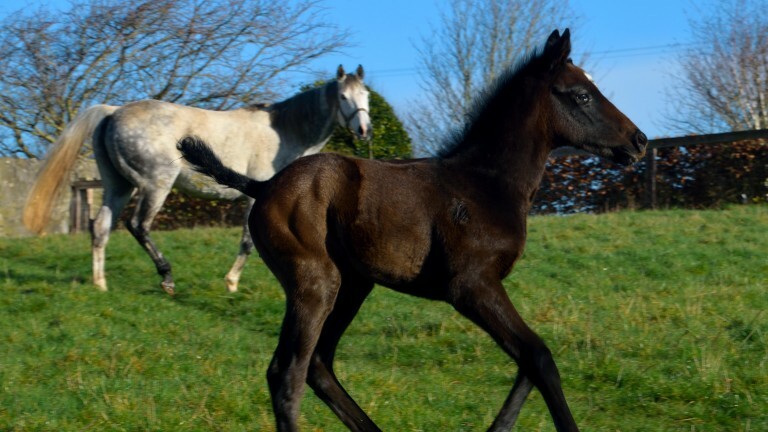 The famed Roundhill Stud in County Limerick has produced stars who have shone in both hemispheres recently and Honora and Bobby Donworth are continuing to nurture and grow the families that have produced relations Rizeena and Puissance De Lune as well as Bow Creek. Rizeena scored at successive Royal Ascot meetings, first winning the Queen Mary Stakes and returning a year later to land the Coronation Stakes. In between those Royal Ascot triumphs was her first success at Group 1 level, in the Moyglare Stakes. The daughter of Iffraaj was the final brilliant filly of Clive Brittain’s magnificent career. Her dam Serena’s Storm has foaled a beautiful daughter of Kingman and Honora describes the filly as "a fine individual" and her dam will return to Iffraaj this season in the hope of producing a brother or sister to Rizeena. Serena’s Storm already has a two-year-old sister to Rizeena, sold by the Donworths at last year’s Goffs Orby Sale for €410,000 to Blandford Bloodstock. The matriarch of the family is Princess Serena, an 18-year-old daughter of Unbridled’s Song out of a half-sister to the magnificent US champion and producer Serena’s Song. Last year she had a filly by Shamardal, a cross that has worked exceptionally well in the past. She produced Puissance De Lune to the now privately used Darley stallion, and the nine-year-old’s first crop of foals were born in Australia last autumn after an impressive racing career there that saw him win multiple Group 2 races and finish placed five times at the highest level. Puissance De Lune's sister, now three and called Princess De Lune, was retained by Honora and Bobby and is in training with Roger Charlton. “Princess Serena was empty last year to Gleneagles but she goes back to him this year and hopefully she can get in foal,” Donworth added. Pure Symmetry is the third mare from the family of Serena’s Song owned by Roundhill Stud and the one most closely related to the champion, as she is a daughter of the now-retired superstar broodmare. By Storm Cat, she is a sister to Sophisticat, who won the Coronation Stakes in 2002. Bow Creek, new to the roster at Haras du Logis this year, was bred by the Donworths and his dam Beneventa is in foal to Exceed and Excel. Bow Creek is by Shamardal and Beneventa will this year visit Shamardal's top sire son Lope De Vega. The Beneventa family is growing deep roots at Roundhill Stud. “We bought Bint Nayef at Tattersalls in December in foal to Iffraaj," said Donworth. "She is a daughter of Beneventa and we bred her so we decided to buy her back when she came on the market. A number of the new recruits to the stallion ranks are set for dates with a choice group of the Roundhill mares. Chief among them is Ballylinch Stud-based Prix du Jockey Club winner New Bay. Irish 2,000 Guineas winner Awtaad will cover Allegrezza after she gives birth to her foal by Australia. The daughter of Sir Percy is out of a sister to Distant Music and hails from the family of African Rose, Fair Eva and Termagant. Another Roundhill graduate excelling in Australia is Libran, runner-up in last year’s Sydney Cup and trained by Chris Waller for Highclere Thoroughbred Racing in Australia. The seven-year-old son of Lawman made his seasonal reappearance behind stable companion Winx on Monday and his dam, True Crystal, is set for a date with another of this year’s first season sires – Marcel, a son of Lawman. A daughter of Sadlers’ Wells and out of Lancashire Oaks winner State Crystal, she comes from the family of Crystal Music, Zelzal and Ocovango and is also in foal to Lawman. Flurry Of Hands, a homebred winning daughter of Acclamation, will be among the first book of mares for Lanwades Stud’s new sire Bobby’s Kitten. Out of the American winning mare Leopard Hunt, she is a half-sister to Group 3 winner Epic Love, who was also placed in the Prix Saint-Alary. Her first foal was a filly by Tamayuz and she has a two-year-old daughter by Lope De Vega and is in foal to Mukhadram. Another young mare who has joined the Roundhill broodmare band is Ventura Mist, a Listed-winning daughter of Pastoral Pursuits. “Ventura Mist has foaled a lovely filly by Dark Angel and she visits Muhaarar next. We bought two new mares at Goffs in November. Dufoof is a daughter of Shamardal out of Evensong, we bred her and sold her as a foal so she is back home, and she will go to Zoffany for her first cover. One of the blue-blooded residents of Roundhill Stud is Steal The Show, a half-sister to leading New Zealand-based sire Tavistock. “Steal The Show is owned by Bloomsbury Stud and is in foal to Zoffany. She will be going to Dalham Hall to be covered by Golden Horn,” said Donworth.